I am writing to express Placer Land Trust's strong support for designating the North Fork American River from the Colfax Iowa Hill Bridge to Lake Clementine as a California Wild & Scenic River. Placer Land Trust is an Auburn-based publicly supported nonprofit dedicated to working with willing landowners to protect natural and agricultural land for public benefit. We have deep roots in the foothill communities we serve and we are members of the Auburn Area Chamber of Commerce and other local Chambers. We greatly value the economic, environmental, and social benefit of protected open spaces to our community. along the North Fork was the central reason Placer Land Trust was formed in the early I 990s. Since then, Placer Land Trust has protected over 1,400 acres of land in the North Fork American River canyon. These lands contain important wildlife habitat and cherished public trails, and by permanently protecting these lands we're also protecting our water, river access, scenic beauty, and local recreation and tourism economy. and the State of California. These investments were made because these individuals and organizations want the North Fork American River to remain "wild and scenic" and contribute to our local economy, environment, and quality of life now and for future generations. We urge the Natural Resources Agency to honor these investments and support the inclusion of this stretch of the North Fork American River as a California Wild & Scenic River. For many reasons, the Wild & Scenic designation also makes good economic sense for Auburn. First, adding the Wild & Scenic designation to the North Fork will encourage much greater future investments from public and private conservation grant-making organizations, as funders gain confidence that their investments will stand the test of time. new group of outdoor recreation enthusiasts. More importantly perhaps, it will provide an assurance for business serving tourists that their livelihood - the American River - will be permanently protected. conservation groups, federal land agencies, mitigation companies, and families. All of these landowners have made a commitment with Placer Land Trust to permanently protect these important lands. The Wild & Scenic designation will strengthen that commitment. Codfish Falls Trail Preserve: 30 acres near Ponderosa Road below Weimar, containing a stretch of the popular Codfish Falls Trail, one of the most popular trails in the American River canyon outside the Confluence area. The Codfish Falls Trail has been featured in Sunset Magazine and other periodicals, and provides a family-friendly introduction to the 100+ miles of trails in the Auburn State Recreation Area. The Codfish Falls Trail Preserve is co-owned and managed with Protect American River Canyons. It is open to the public 24/7. Long Point North Fork Preserve: 40 acres at Long Point below Applegate, buffering and adjacent to the immensely popular Upper Lake Clementine day use area of the Auburn State Recreation Area. Our other recent acquisitions along the river are the 160-acre Mergen North Fork Preserve at Staircase Rapid in the "Gorge" below Colfax, and the 40-acre Bailey North Fork Preserve in the nationally recognized Wild & Scenic North Fork stretch near Alta. Also, in April this year, with significant grant assistance from the California Natural Resources Agency, Placer Land Trust donated the 416-acre Big Bend North Fork Preserve below Foresthill (along with a privately funded $95.000 endowment) to California State Parks for inclusion in the Auburn State Recreation Area. Placer Land Trust and our members, supporters and partners have worked for 20 years to protect the North Fork American River, and we fully support the Wild & Scenic River designation. I hope you will too. I am writing to express the Bailey family's support for designating the North Fork American River from the Colfax Iowa Hill Bridge to Lake Clementine as a California Wild & Scenic River. My father Matthew Bailey was instrumental in obtaining National Wild & Scenic designation for the upper North Fork in the 1970's. Auburn Dam reservoir that would have seasonally flooded this stretch of river. We hope that the California Natural Resources Agency will recognize the significance of this priceless 16 mile stretch of river and recommend CA Wild & Scenic designation from the National Wild & Scenic boundary near Colfax to Upper Lake Clementine for all to appreciate, enjoy and responsibly care for. encourage others to protect, respect and take good care of the North Fork of the American River. Thank you for the opportunity to share a piece of our family history and request your support. I am writing on behalf of the North Fork American River Alliance, NFARA. We strongly support designating the North Fork American River from the Colfax Iowa Hill Bridge to Lake Clementine as a California Wild and Scenic River. We urge you to support this designation as well. NFARA is a non-profit 501(c)(3) organization dedicated to the preservation of the wild, scenic and cultural heritage of the North Fork American River in Placer County. This designation fits in with our goal of preserving critical habitat, protecting water resources, and providing varied recreational opportunities like hiking, fishing, swimming, and white water boating. It is also a key step toward protecting the economic and recreational potential of our local canyons. NFARA has long recognized the Wild and Scenic potential of this stretch of river. We help organize river cleanups twice a year co-sponsored by CA State Parks Foundation and the Sierra Nevada Conservancy. NFARA also leads hikes, provides trail maintenance and supported recent suction dredge mining regulations on the North Fork American. Designation will complete the protection of one of California’s remaining free flowing streams. The 38 mile stretch of river from the headwaters to the Colfax Iowa Hill Bridge was designated Wild and Scenic in 1978. The lower 16 miles to Lake Clementine was also found eligible but was left out of W&S designation due to the proposed Auburn Dam. We hope the California Natural Resources Agency recognizes the significance of this priceless 16 mile stretch of river for its wild nature, its critical habitat, its recreational opportunities, and its economic potential. Please join with us and support its designation as a California Wild and Scenic River. I'm writing to express my support for designation of the North Fork American River from the Colfax - Iowa Hill Bridge at Mineral Bar to Lake Clementine as a California Wild and Scenic River. I urge you to also support this designation as it would be a perfect compliment to the federal and state wild and scenic designations of the upper North Fork American River. The designation will provide protection for the free flowing North Fork American River above Lake Clementine, regional recreation and local economic potential. rafting, kayaking, swimming, wildlife viewing and exploring historical sites. While the section of the North Fork American River being proposed for designation is in close proximity to communities and development along I-80, it is remarkable that it has maintained wilderness like qualities. There is some private, but a lot of the lands in this part of the canyon are in public ownership or are owned by land conservancies. There is little development along this stretch of the canyon and its wilderness, scenic and recreational qualities should be protected now and for future generations from damage to the canyon environment that will happen if water projects were to be developed in this part of the canyon. This part of the canyon does not only provide recreation for the local communities but also the region. Over the years I have seen the increase in usage and this is not surprising with the population growth that we have seen in the region the last couple of decades. The increase in usage has placed pressure on the Auburn State Recreation Area to provide more recreational opportunities. Designation would help ASRA obtain funding and support to provide those opportunities to meet the needs of public recreation. The increase in usage has been a big benefit to the local economy as it has drawn more local and regional visitors to the area resulting in more business. It is clear that this section of the North Fork American River and canyon are a valuable resource that adds to the local economy and provides recreational opportunities that increase the quality of life for people of the region. l hope you will take this opportunity to extend the state protection from the current federal and state wild and scenic boundary at Mineral Bar to Lake Clementine by designating this section of the North Fork American River as a California Wild and Scenic River. I am writing to express my strong support for the designation of the North Fork American River from Iowa Hill Bridge to Lake Clementine as a California Wild and Scenic River. I have become aware of the incredible value of this resource as a researcher and Extension Specialist in the Wildlife, Fish and Conservation Biology at the University of California - Davis, as member of the Board of Directors of The Sierra Fund (an organization that focuses on the restoration of waterways affected by historical mining activities), and as a private citizen. Through my research at UC Davis I have had the opportunity and great pleasure to study the wild fishes of the North Fork American River. As one of the few remaining largely unregulated (undammed) rivers on the west slope of the Sierra Nevada Range, the North Fork American River provides a rare example of a river with natural seasonally varying flows, including a strong spring snowmelt flow, which is important for migratory fish species such as salmon and steelhead. The North Fork American River also provides a valuable point of comparison with other rivers that have experienced greater modifications, and a critical template toward which these rivers could be restored in order to provide improved wildlife habitat. I relied on the deep cold pools of the North Fork American River as ideal examples of coldwater fish habitat, in a study on ways to conserve the threatened spring-run Chinook salmon of Butte Creek, in the Feather River Basin. The North Fork American River itself may yet prove to be valuable habitat for salmon and steelhead, given the ongoing planning by multiple public agencies to provide passage for migrating salmonids to once again reach habitat upstream of dams such as Shasta, Folsom, and New Melones. The North Fork American River provides a valuable recreational resource for the citizens of the region, and California as a whole. In particular, its free-flowing waters are a mecca for whitewater rafting and kayaking enthusiasts. My first introduction to the North Fork was as a trainee whitewater rafting guide, and I have grown to appreciate the power and subtlety of its flows as a whitewater kayaker. The intersection of the biological richness of the North Fork American River and the close proximity of the river to the Sacramento Region amplifies its unique value. People of the region may come to the river for a day of recreation, whether boating or hiking, fishing or birding, and leave the valley with a newfound appreciation of what a wild, free river can be. Designation of the North Fork as a California Wild and Scenic River will provide the protection for this extraordinary resource so that future generations will have the opportunity to experience, appreciate, and learn from it. Sacramento) and as a private citizen who has come to love the North Fork. We are incredibly fortunate to have this healthy, free-flowing river just forty-five minutes from Sacramento for its recreational value and for its scenic beauty. For the citizens who currently enjoy the river and its canyons, and for those who will in the future, it provides the opportunity to step into a setting of rare beauty that helps everyone who visits to appreciate the importance of the natural world at a time when development has taken over so many of the remaining natural places. Perhaps more importantly, we are incredibly fortunate to have this healthy, free-flowing river for the ecological benefits we gain from it. Its crystal clear waters contribute to the health lower American River and Sacramento River Delta. Its canyon and the river itself provide a natural area that is a refuge for a wide range of native plants and animals in a contiguous corridor that connects with and contributes to the health of ecosystems up the river into the Sierra. Designation of the North Fork as a California Wild and Scenic River will provide the protection for this tremendous resource that it so deserves and that future generations deserve so that they can appreciate its beauty and gain the benefits of its contributions to the ecological health of the region. Please let this letter serve as my enthusiastic support for designating a portion of the North Fork American River, between Colfax-Iowa Hill Bridge and Upper Clementine Lake, as a California Wild and Scenic River. I am a botanist and ecologist who taught in the California Community College system for nearly 35 full-time years. The last 18 of those were at Sierra College, Rocklin Campus. During that time, I led countless ecological field trips throughout the Sierra Nevada. Scores of these field trips were in the American River Canyon, especially on the North Fork. I have taken hundreds of students down the Stevens Trail, just above the Colfax-Iowa Hill Bridge. Hundreds of students have accompanied me for botanizing at the Mineral Bar Campground and along the Indian Creek, the Codfish Falls and the Windy Point Trails. We have spent hundreds of hours searching out and identifying both common and unique plants, fungi and animals. We have enjoyed seeking out and finding the uncommon California nutmeg (a conifer) trees, the elusive foothill yellow-legged frog (proposed for ESA listing) and myriad species that characterize the beauty and biological diversity of the North Fork American River Canyon. From Foothill Woodland oak-pine forests to open, wildflower-strewn grassy slopes and cold, clear running side streams, the North Fork American represents significant California habitat and precious public-access lands. As California grows in population and, commensurately, in demands for resources, it is critical that we protect resources that might be sought unsustainably, for future citizens. The California Wild and Scenic designation of the North Fork of the American River, between the Colfax-Iowa Hill Bridge and Upper Lake Clementine would be an exceptionally prudent action to take. The American River, as a whole, is already a very hard-working resource for our region. Dozens of dams and conveyances provide water and power for thousands. Yet, resource developers relentlessly pursue additional opportunities – all of which threaten the biological richness and environmental health of that what remains unspoiled. As an educator, I have given my life to providing scientific knowledge to younger minds. I have advocated responsible and sustainable development while criticizing activities that result in net losses for future generations. The American River system represents a large ecoregion that is tipping in the balance. Its riverine resources have been aggressively, and unsustainably engineered. Our ignorance of fire, its history and its ecological benefits, have placed us in an exceptionally precarious position. These realities, combined with climate change and drought, must be met, head-on, with clear thinking decisions, rooted in science and sustainability. Protecting, in perpetuity, remaining wild areas will help us inch toward tipping the balance back toward environmental and social sustainability. For the tens of thousands who still will come to hopefully benefit from the myriad resources available to them, we must do all we can to identify locations in need of our attention and methodologies that will ensure natural ecological functions and ecosystem benefits. We will all benefit from such actions. The designation of the North Fork American River as a California Wild and Scenic River would be a very wise step in the right direction. I'm writing to express my strong support for designating the North Fork American River from the Colfax Iowa Hill Bridge to Lake Clementine as a California Wild & Scenic River. As a Placer County Artist, residing in Colfax near the North Fork, I'm extremely concerned about any changes to the North Fork American River. First of all, let me explain who I am. I'm an award winning artist living in the Auburn Colfax Area since 1983. Through the time that I have lived here, my art work has become world known through my online watercolor classes. Many of the paintings depict the beautiful American River and it's tributaries. It would be a personal heartbreak to see changes that would keep me from drawing inspiration from such a scenic area. I also conduct on location workshops and weekly classes on and near the American River. Through my classes I have influenced many students that now teach on-location painting as well. Thank you for your consideration. You are welcome to view my paintings on my website. I am writing to express the Placer Nature Center's support for designating the North Fork American River from the Colfax Iowa Hill Bridge to Lake Clementine as a California Wild and Scenic River. Placer Nature Center has been providing regional nature education opportunities for schools, families and individuals from our site in Christian Valley and from various field locations including the American River for the last 25 years. The North Fork of the American River is a critical rare wild river habitat site that we turn to, when possible, for its qualities as a natural free-flowing river educational site in the foothills. Participants in our field trips can experience the uninterrupted seasonal aquatic cycle of life that changes with the flows and water temperature. By the time most Sierran Rivers have reached the foothill elevations they have been dammed and are an artificially controlled artifact of the natural river cycle. Here on the North Fork flows surge in the spring but by summer are down to a trickle. This creates delicate survival adaption strategies in a river whose waters warm significantly in the summer. Fish must find deep cool pools to survive. Aquatic invertebrates, for the most part, need to have transformed into their winged life cycle stage. Sediment needs to have settled so that amphibian eggs can oxygenate and hatch. All of this and more can be observed, measured and monitored on the North Fork American. As we look at the science associated with a free flowing river we have an opportunity here to protect critical habitat that was found eligible for Wild and Scenic designation in a 1993 study. Placer Nature Center hopes that you will respond to this opportunity and designate the North Fork American River from the National Wild & Scenic boundary near Colfax to upper Lake Clementine a California Wild and Scenic River. Some time ago American Whitewater Board of Director members from across the nation had the opportunity to experience the beauty of the North Fork American River firsthand. Thus, as strong advocates for wild and free-flowing rivers that provide worldclass opportunities for outdoor recreation and sustain ecosystems in our own backyard, we are writing to express our enthusiastic support for designating the North Fork American River from the Iowa Hill Bridge to Lake Clementine as a California Wild & Scenic River. Founded in 1954, American Whitewater is a national nonprofit, 501(c)(3) organization devoted to protecting and restoring America’s whitewater resources and to enhancing the public’s ability to enjoy them safely. American Whitewater is a membership organization with over 5,800 members and 100 affiliate clubs representing whitewater paddlers across the nation. Our California affiliate clubs include Loma Prieta Paddlers, Chico Paddleheads, Gold Country Paddlers, NorCal River Runners and Shasta Paddlers. The North Fork American River from Iowa Hill Bridge to Lake Clementine provides two whitewater runs popular with our membership. California Wild and Scenic River designation is needed on the North Fork American River from Iowa Hill Bridge to Lake Clementine to insure the preservation of these high quality whitewater runs and is an important conservation tool for ensuring that future generations can enjoy the beauty of this free flowing river. The Upper American River Foundation (UARF) wants to let you know that we support the expansion of the existing Wild and Scenic River status of the North Fork of the American River near Colfax, CA downstream to include the area from the Iowa Hill Bridge at Mineral Bar down to the confluence with Shirt Tail Creek to help protect the fishery in this area. This reach of the NF American River was found in 1993 to qualify as a Wild and Scenic River. We encourage you to support this high level designation for the pristine section between Iowa Hill Bridge and Shirt Tail Creek to help protect the fisheries interest in this locally and nationally significant river. The Sac-Sierra Chapter of Trout Unlimited (SSTU) wants to let you know that we support the expansion of the existing Wild and Scenic River status of the North Fork of the American River near Colfax, CA downstream to include the area from the Iowa Hill Bridge at Mineral Bar down to the confluence with Shirt Tail Creek to help protect the fishery in this area. 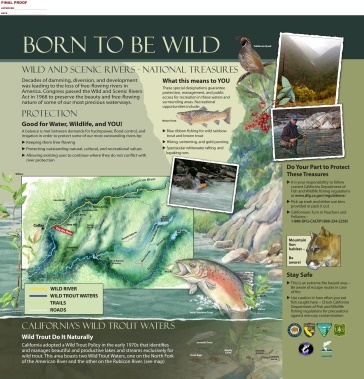 A few years ago, SSTU joined forces with the Upper American River Foundation, the Auburn State Recreation Area, the California Department of Fish and Wildlife, the US Forest Service and the Bureau of Land Management to produce an interpretive display "Born To Be Wild" describing the Wild and Scenic and Wild Trout Stream status' of the North Fork American River upstream from the Iowa Hill Bridge (please see the attached photo). This area is starved for information and this display has been highly popular since its deployment.